Easy wine bottle to vase DIY project is just what the title states. Easy! Every once and a while, I get crafty and get out of the kitchen and create something for my home. My blogging friend, Susan from Organized 31, challenged me to take a piece of “trash” and make it something beautiful. This was about a month ago. The piece of trash I was to work with was a wine bottle (no, I didn’t drink the wine). To be honest, it sat in my office/sewing room for a while. I would see it every day and every day I would think, “What the heck am I going to do with that?”. Then it hit me, make it a vase! Originally, I wanted to wrap it in yarn. I had just seen a post Susan did on how she made a Kool-Aid Dyed Yarn DIY Plant Pot. I thought the project came out great! Then I realized, I didn’t have any yarn or Kool-Aid! Don’t you hate it when that happens? What I did have was some jute rope that I had picked up at Joann Fabrics. Don’t worry, I used my coupon and got it for half price! I pulled out my glue gun and got to work. Remember how I said this wine bottle to vase DIY project was easy? It is also fast. Within about 20 minutes, I had my vase finished. I only burnt my finger once! Place a line of glue around the bottom of the bottle. Lay the jute rope on top of it. Keep doing this all the way to the top. I worked with the bottle on it’s side most of the time. When I got to the top, it was easy to lay the jute rope with the bottle standing. I love the way this came out, don’t you? I put some silk sunflowers in it, but plan on cutting some flowers from my garden to place in it. While showing this off to my daughter, we decided you could also use this for candles. You could easily and quickly make a bunch of these for a party or a nice dinner! What would you make with an empty wine bottle? I would love to hear! 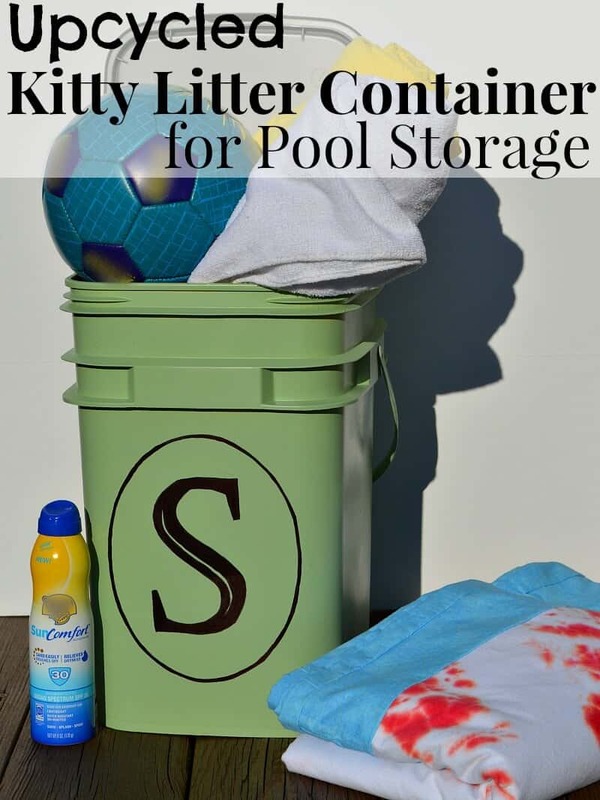 My good friend Susan made this Upcycled Pool Storage container from an empty kitty little box! Thanks so much! I really had fun making it and now want to make more! I hope you share some photos when you get yours complete! This looks wonderful and I think maybe I can swing this! I’ve not had good success with craft projects in the past…LOL Have a great day! I love a friendly challenge. 🙂 If all trash looked this good! Thanks for partying with us at TALENTED TUESDAY! Very cute! I love how rustic it looks. Thanks for sharing with us at the Merry Monday link party. I hope you’ll join us again next week. Sharing your post on Twitter!